My favorite green burlap bag fell apart. Just in time for the discovery of this 75-cent tote for fall! I've been scouring stores and even etsy, willing to pay retail price, for a bag like this. Beautiful! Yippee, it is finally letting me leave a comment, I'm guessing a blogger bug. Anyway, I love your blog, I have read it all and it has been greatly inspiring. Now to move away from the EXCESSIVELY expensive CA. I love that bag! You find the best deals! Love that tote! And for 75 cents! Wow! That bag is beautiful. I must admit. Bags are my weakness. Which is weird, because I don't have a weakness for purses. Natalie, since you've been looking for something just like this, would you like to have it? I certainly have a few other (ten) tote bags to use! I don't have your contact information, but if you'll email me at likemerchantships@yahoo.com, you can let me know where to send it. Toile is my downfall- I melt at the knees when I see it. I've had lots of fun surprises at Garage Sales and Salvation Army and the best toile item I found was a gorgeous lamp at a garage sale. Maybe I'll try to make one of these totes with some toile fabric I have. You always inspire me. 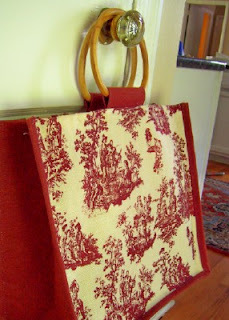 LOVE your blog and LOVE your toile tote. I love ALL things toile and yes I want to marry it!! Can you tell me where you found it as it would be the perfect size (and price!) for my bible study materials as the one I have has worn out. What a cute little bag!! and what a great deal!! How come I don't find things like that for 75 cents. I have a toile fetish . . . where did you get this pretty bag for 75 cents?